There was once a time, travelers all over the world would decorate their suitcases with colorful stickers showcasing various countries and landmarks they've been to. It was a fun way to document life's adventures. 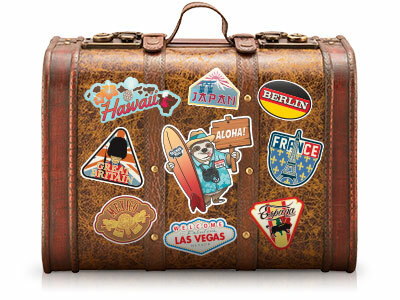 Today, we don't see many stickers on suitcases but it doesn't mean you can't bring back the trend! How about putting travel stickers on your laptop, fridge, desk or car? Our stickers are bubble-free so they can easily apply to your travel gear and are waterproof and outdoor durable for any travel destination. Get started with a FREE sheet of travel stickers! *Use promo code ILOVE2TRAVEL at checkout. *Promo code is only valid for one order of White Vinyl stickers on one sheet.